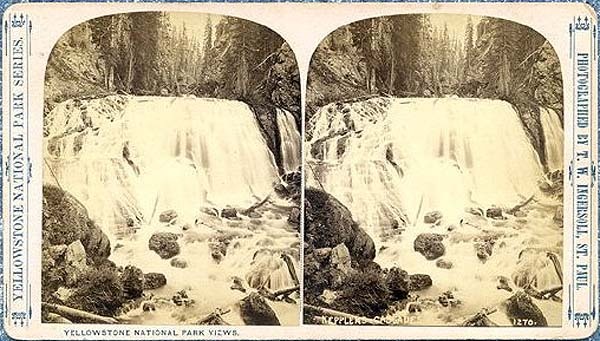 Truman Ward Ingersoll is undoubtedly one of the greatest enigmas when it comes to not only his Yellowstone stereoviews but his entire career as a stereoview publisher. He was born Feb 19, 1862. During his roughly 30 years as a publisher and photographer, Ingersoll released over 4,000 different United States and World Views. Yet today, information on this prolific photographer is very scarce indeed. 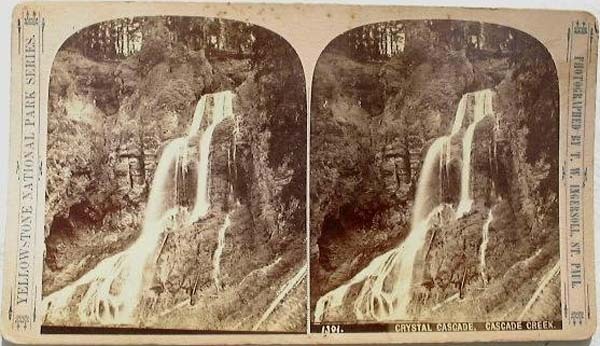 Part of Ingersoll’s mystery is in the fact that early in his career, he produced arguably some of the nicest, high quality stereoviews of the 1880’s. His subjects emphasized the northwest. 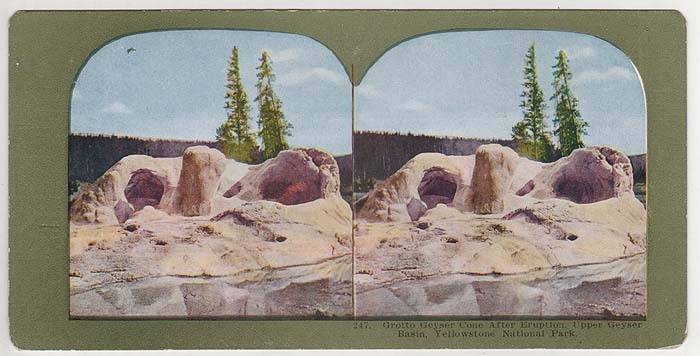 Not only did he extensively stereoview Yellowstone, but also had sets of the Pacific Coast and much of his native Minnesota. 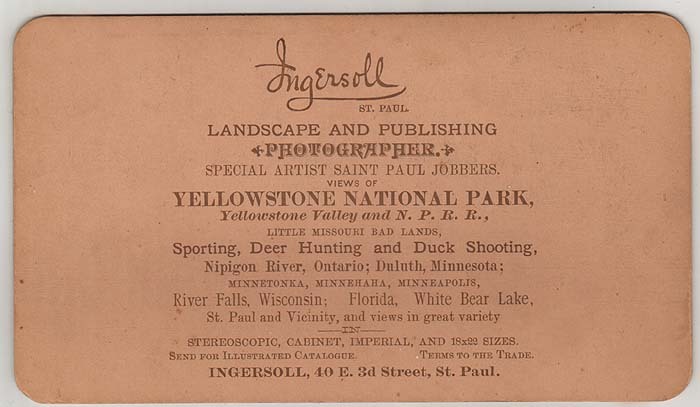 During the decade of the 80’s Ingersoll produced a large series of hunting scenes (more than 300 views), no less than 4 series of Yellowstone National Park, and other western stereoviews (nearly 300). These views were Cabinet and Imperial sizes of the highest standard. Yet today they are the rarest of Ingersoll’s views. 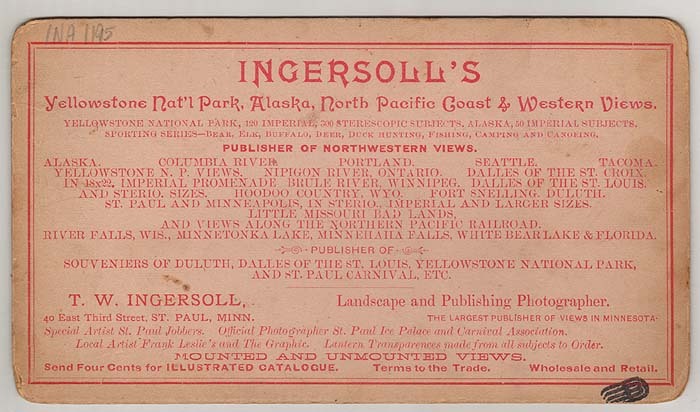 During the mid-1890’s, Ingersoll expanded his coverage with sets of world scenery, the Klondike Gold Rush in Alaska and the Chicago Exposition. By the late 1890’s it seems that Ingersoll realized that competing with the likes of the growing giants like Underwood & Underwood, BW Kilburn, and the Keystone View Company for high-end stereoviews was a losing proposition. Unable to sustain the competition with these new major publishers, he began issuing copy views in about 1898. Unfortunately the quality was low and so were the sales. In an effort to revive his struggling business, Ingersoll re-invented himself around 1900 as a major publisher of half-tone lithoviews. The majority of these views were from original Ingersoll negatives, although he did buy a few from other photographers. The color lithos were made in huge quantities and some were given as premium inserts in Quaker Oats products. He also sold the rights to his photos to other lithograph publishers for their sets, including Sears, Roebuck & Co. and the American Novelty Company. Also during this period, low quality real photo Ingersoll views were issued in sets by the New Educational Series and Webster & Albee. 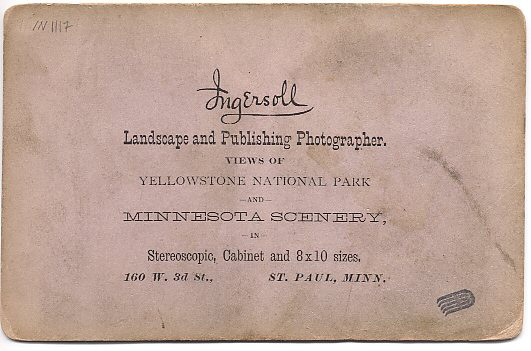 Striking is the fact that during Ingersoll’s litho period he still had one love: Yellowstone. 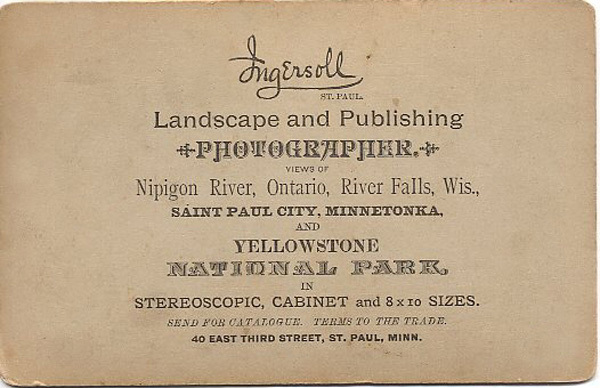 During the years 1905-1910, Ingersoll put out 3 new Yellowstone series of high quality black and white views under his company monikers, the "Ingersoll View Company" and "High Grade Original Views." These sets were comprised of all new photographs of the Park. 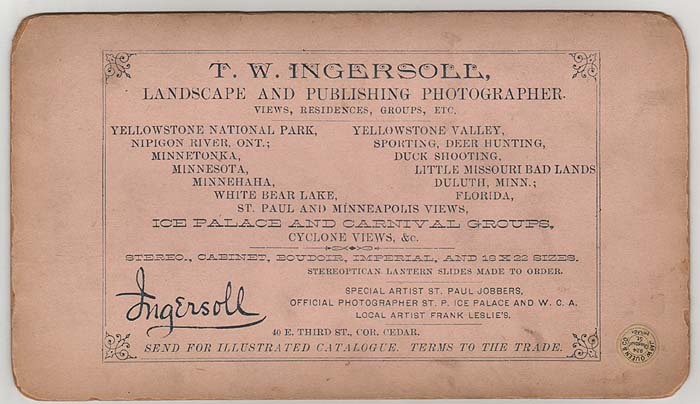 It is not known if Ingersoll took these himself or purchased them from other photographers. 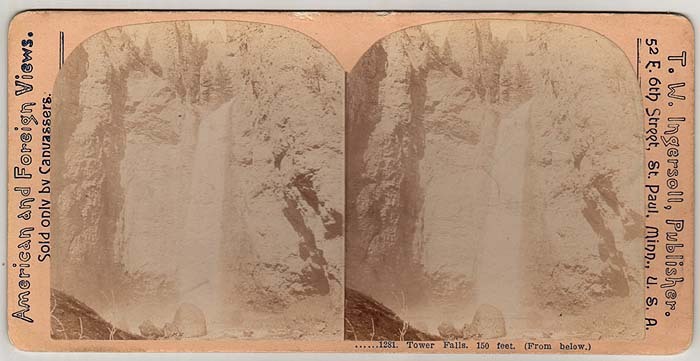 They were some of the most interesting views ever produced of Yellowstone, as Ingersoll chose to stereo less common park scenery. 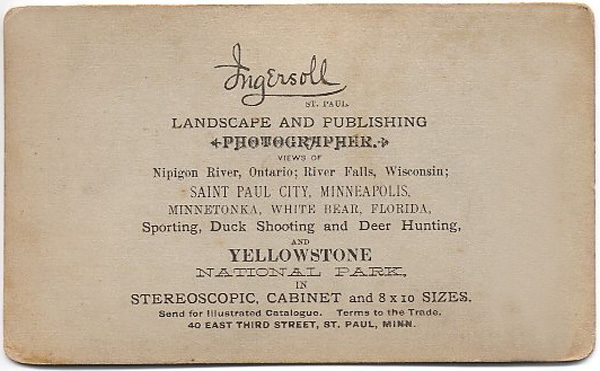 After selling his St. Paul photography business, Ingersoll lived in Buffalo, Minnesota. He died in St. Paul on June 9th, 1922. His negatives passed to the Keystone View Company and today are housed in the photo archives at the University of California-Riverside's Keystone Mast Collection. William Henry Jackson and F. Jay Haynes have had more overall importance. 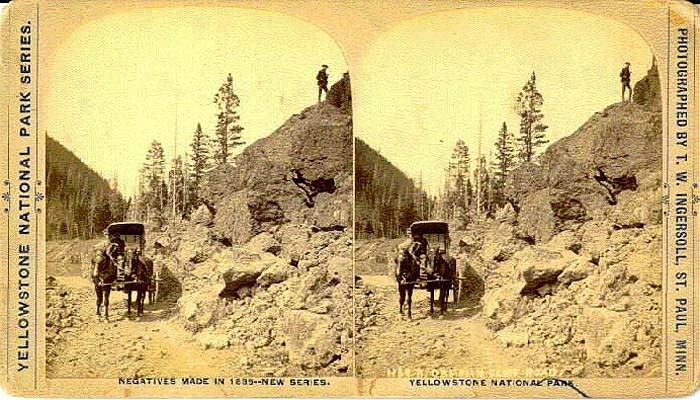 No photographer released more styles and printings of Yellowstone stereoviews than TW Ingersoll. 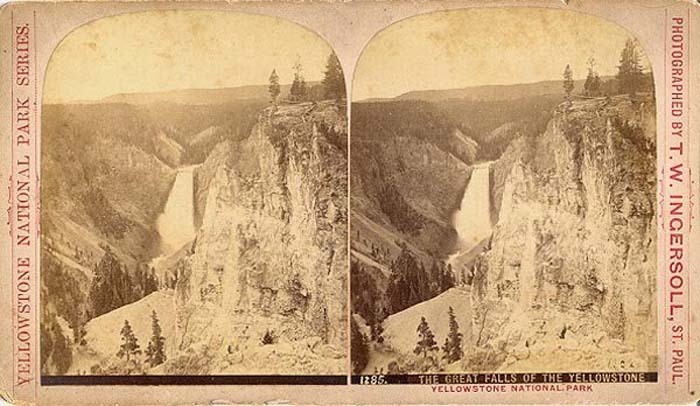 While Haynes may have had more individual photos, his dozen or so sets pales in comparison to the nearly 50 different Yellowstone variations of Ingersoll views. 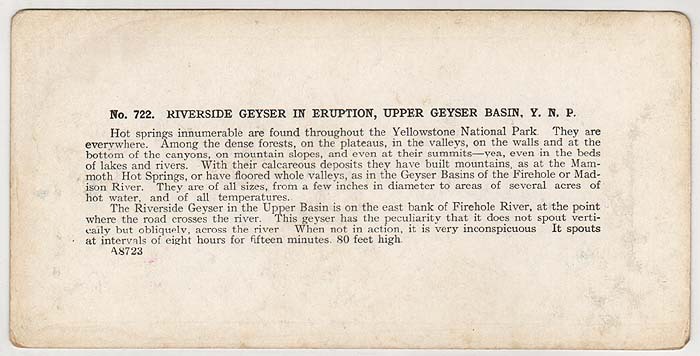 What has been deduced so far is a seemingly bottomless pit of variations of Yellowstone views by Ingersoll. It appears that all of his views and series may be from photos taken on only three visits to the park. His numbering system is very complicated and has led to much confusion. 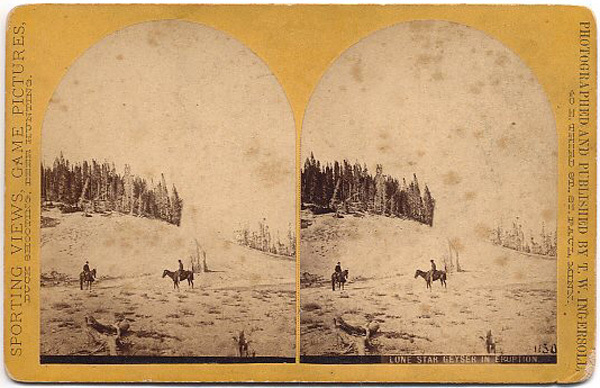 Before we get in the detail of Ingersoll’s Yellowstone Sets, here are a few examples of his Imperial sized mounts (4 ½ x 7). These images represent some of the rarest and most interesting of all of Ingersoll’s views. They are so scarce that it is virtually certain that they were not part of an organized set, but rather were available by special order only. They also appear to be very early Ingersoll photographs. 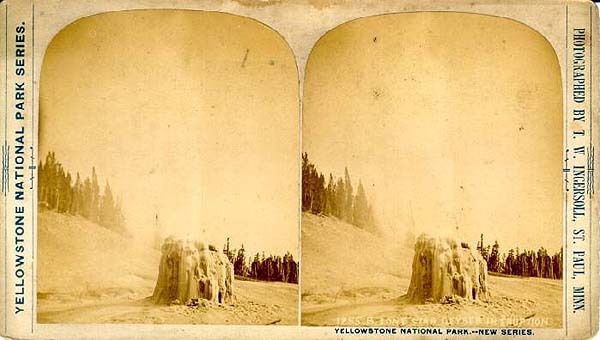 I suspect that all were taken during Ingersoll’s first Yellowstone visit in 1884 or 85. 1214 PLACER MINING, EMIGRANT GULCH. This early Ingersoll Imperial Mount shows a mining scene just north of the park near Yankee Jim Canyon. Notice the negative number "1244" scratched into the photo itself. 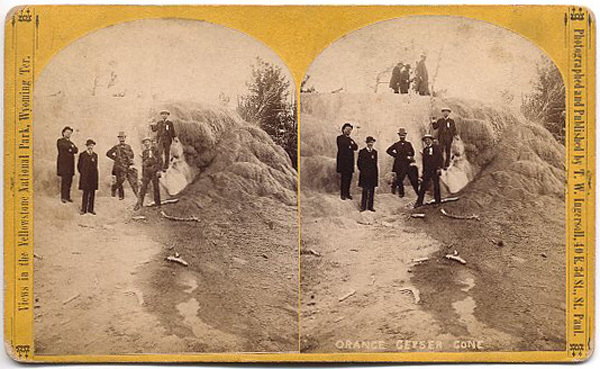 Here is a superb Ingersoll view showing tourists at Orange Geyser Cone (actually a Mammoth Terrace). The title is white over the photo and the view is unnumbered. 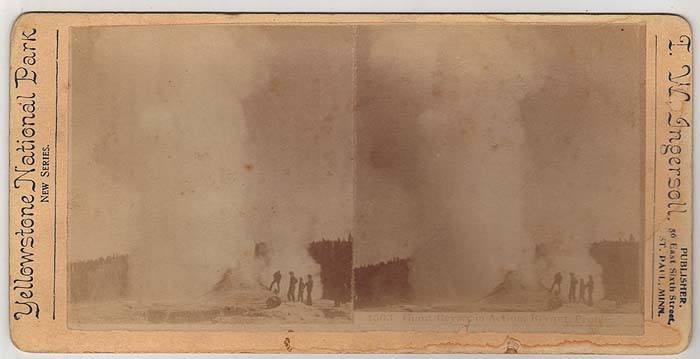 This only happened on Ingersoll’s earliest stereoviews. He was very careful to number his later series. 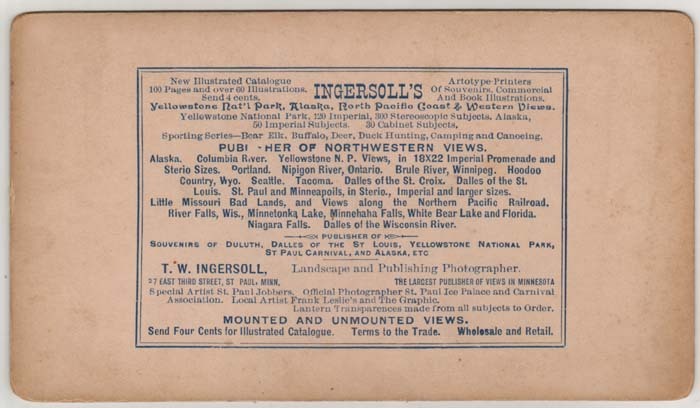 A very early Ingersoll Imperial view from his "Sporting View, Game Pictures" series. 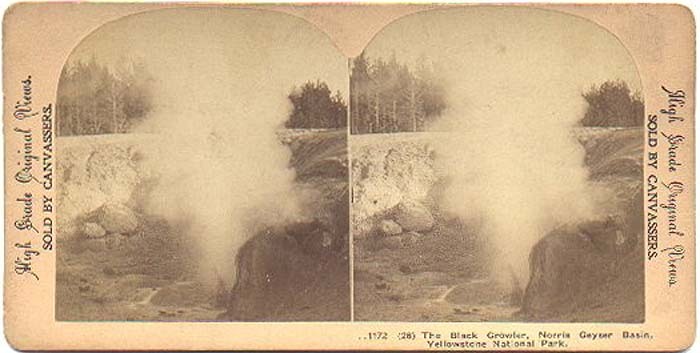 Again the negative number is scratched into the photo, this time a scene at Lone Star Geyser. 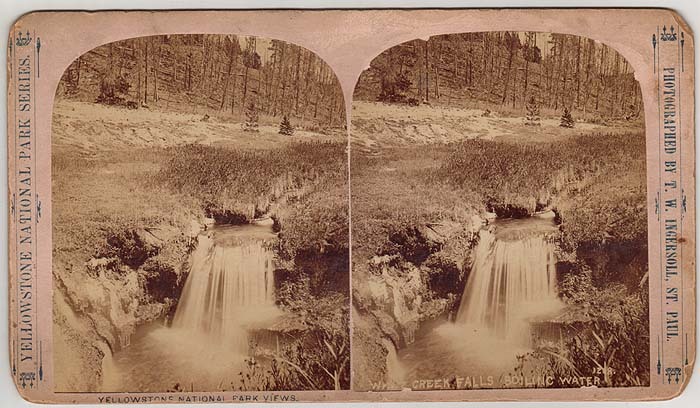 Although labeled on the left side as being in the "National Park," this photo actually shows a man on the lower Yellowstone River north of the park. 1117 GRAND CANYON. DISMAL VIEW. A rare Ingersoll red colored imperial mount. These appear more scarce than those mounted on yellow backing. 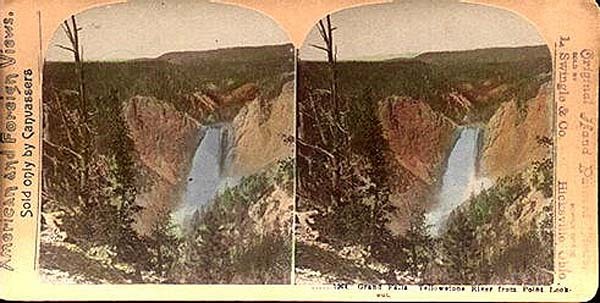 This shows a scene in the Grand Canyon of the Yellowstone. Notice the numbering on the title strip. This probably indicates that this was a later imperial mount issue than those shown above. OUR OUTFIT ON THE YELLOWSTONE RIVER. 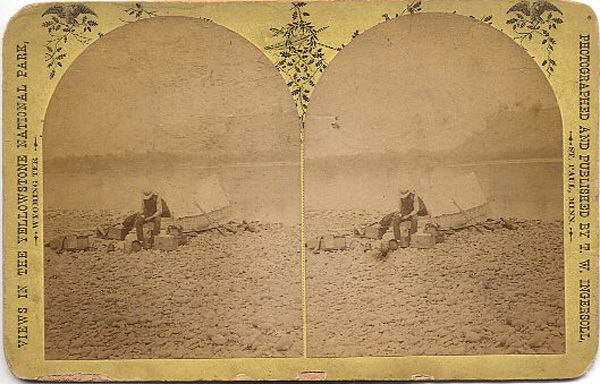 Another view of the same man on the Yellowstone River as the photo two above this one. Though this view is correctly labeled as being in the Yellowstone Valley and not in the National Park. 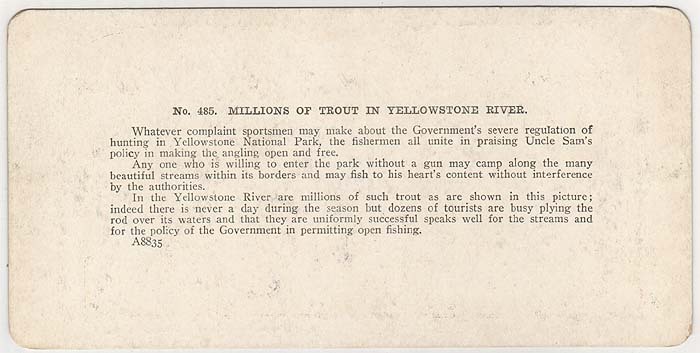 I believe this to be the first and most important of TW Ingersoll’s many numbered Yellowstone series. 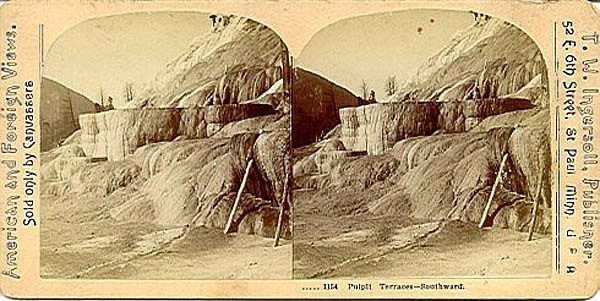 The views were likely photographed in 1884 or 1885. The titles are light-colored over the photo on the lower right front of the view. Nearly all have the number following the title (this is very important in identifying it as a “first visit Yellowstone photo” ) The series images follow what would have been the stagecoach trip that one would have taken around Yellowstone at the time. The series starts north of the park in the Gardiner, Montana area and ends north of the park again after completing the Grand Loop. Numbering of this set appears to range from 1100 – 1324. I believe it to be continuous or nearly continuous for a total of roughly 225 views in the series. Ingersoll did occasionally have gaps in his numbering system, especially in later series, yet I believe this first set was complete or nearly complete. Some of these views (particularly the ones with higher numbers) have the title contained in a black stripe instead of the more common light lettering over the photo. And on these the number comes before the title. I think this may be a subset or perhaps photos that were added into the series at a later date. In some of these striped titles, one can still see the old white title peeking out behind the black stripe. It is likely then that there were multiple printings of this set. Further evidence is the presence of several styles of obverse and reverse for this set. Of the many styles of Ingersoll’s Red Letter series, this is perhaps the most common. Title is white-colored over the photo and the number follows the title. The gentleman in the photo is unidentifed. This Red-Letter view is from a different printing than the one above. The lettering style on the right and left side is of a narrower font. 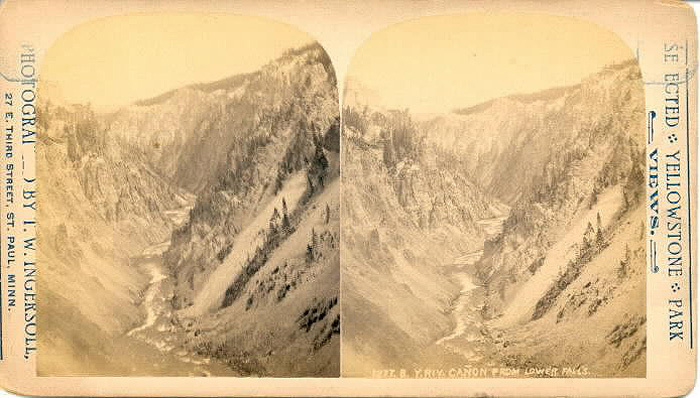 The view shows a coach headed toward Mammoth from Gardiner along the Gardner River. Here we see an example of a Red-Letter Series image with a black title stripe. Why Ingersoll had these different title types is unknown. These are the only Red-Letter views that have the number before the view title. ROAD TO FALLS OF Y.R. 1280. Yet another printing style of the Red-Letter Series. Notice the ornate design before and after the photographer credit on the right side of the view. 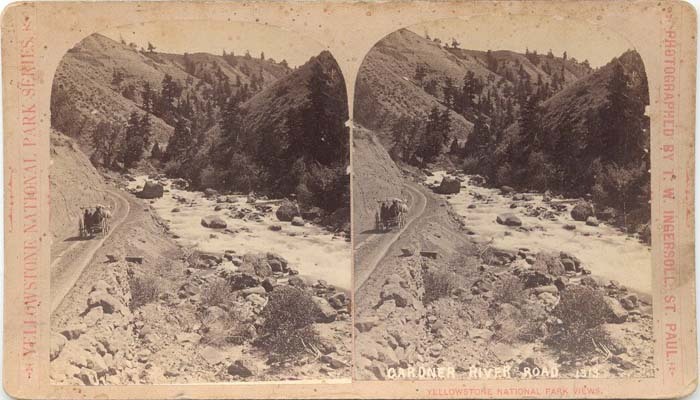 This image shows a coach alongside the Yellowstone River near present-day Otter Creek. Two different Red-Letter Series versos. There are likely others besides these but at least one can see the variety of subjects that Ingersoll was already photographing this early in his career. The Brown Letter Set seems to be a higher quality printing of the red-letter set above. It is also much more scarce. Most likely not all red-letter views were printed for this set. I believe that it was a "selected view" type of series and probably does not include every view. The numbering and photos are identical to the red-letter set. Again titles nearly always appear before the number. The exception is that like the red-letter set, there are some views with a Black Title Stripe over the old title. Some of these have the number first. Views have been recorded ranging from #1128 – #1301. The overall set size would seem to be about one fourth the size of the red-letter set. GOLDEN GATE ROAD SHOWING TRUSTLE 1156. Ingersoll’s Brown Letter Series was probably a smaller version of his Red-Letter Series above. It too had multiple printings. This version has a king’s crown design before and after the side credits. Another Brown-Letter printing has a single tree-like design after the side credits. Like the Red-Letter series, these views have the number after the view title. 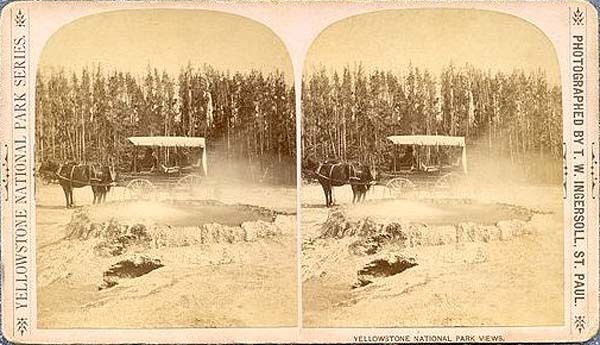 This image shows a coach at Punch Bowl Spring in the Upper Geyser Basin. 1301. CRYSTAL CASCADE, CASCADE CREEK. Here is another of those mysterious black title stripe views. These only seem to be reserved for higher numbered views. This photo shows Crystal Falls on Cascade Creek near Canyon. 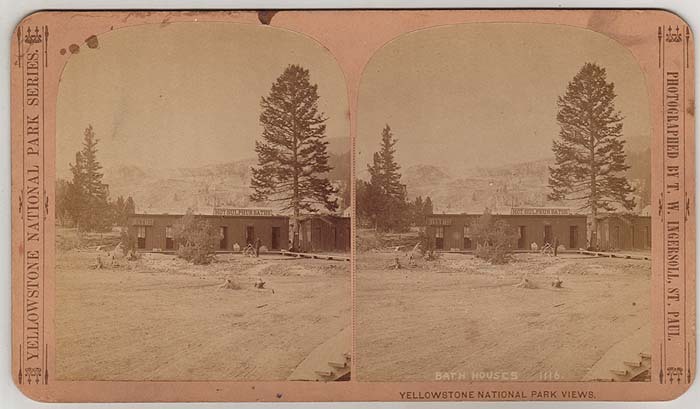 A rare close-up view of the Bath Houses at Mammoth. Almost no photos exist of the rare obsolete park building. Like the brown letter set above, the blue letter set seems to be a high quality, "selected view" printing of the red-letter set. I call it the Blue-letter "A" series in order to differentiate it from the Blue-letter "B" series below. The "A" series did not print the letter A on the view whereas the "B" series did. It appears that this may be an identical set to the brown letter set above. It is roughly one fourth the size of the red-letter set. The timeline would suggest that this set (and the brown letter version) were issued in 1886 and/or 1887. One of two printings of Ingersoll’s Blue-Letter A Series. This issue has a bluer ink color and different verso than its counterpart. Pictured is an odd angle of Kepler Cascades near Old Faithful taken from its base. The second Blue-Letter A Series printing has a darker brown backing and darker blue lettering. The verso credit T.W. Ingersoll rather than Ingersoll’s Views. This waterfall is located on White Creek just upstream from Great Fountain Geyser. 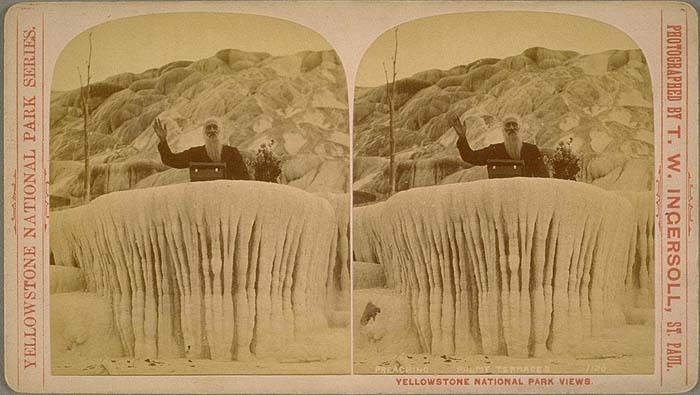 In 1888, Ingersoll (or photographers for him) visited Yellowstone again for new photos and a second series. Most views are copyrighted 1888 and say specifically that they are part of a "New Series." All titles (with one exception that I believe to be a mis-print) now had the number first followed by the letter B. (The opposite of had been done previously) This was to indicate a "B" or second series to the first red-letter one. I have recorded numbers ranging from #1100 - #1283. I believe the numbering to go slightly higher. Like the red-letter set, this one follows a stage trip around the Grand Loop. My view list only goes as far as Virginia Cascades. I suspect there are other views in the northern part of the park (The Tower-Roosevelt area perhaps) that I don’t have recorded yet. It also seems that there are some gaps in the numbering of the "B" series. There are at least four printings of this series. 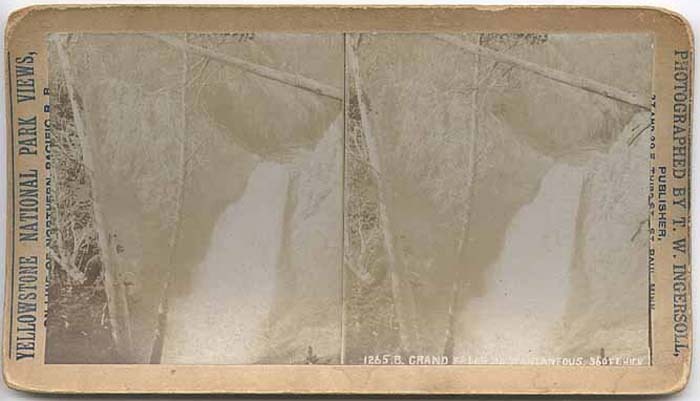 One style has the line, "Negatives made in 1888 --New Series" on the left front of the view. One style does not show this information. 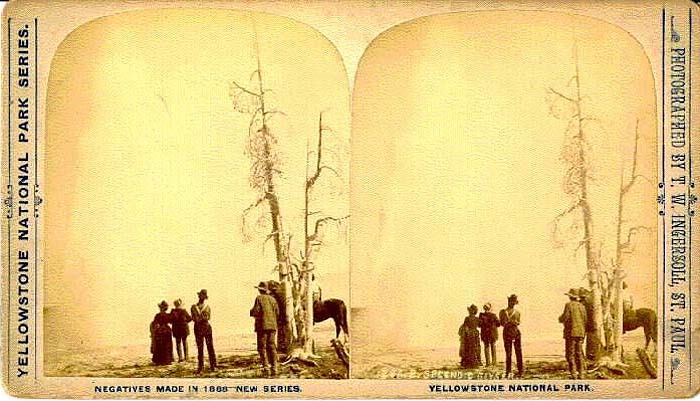 A third printing has only the inscription; "Yellowstone National Park -- New Series" on the right front of the view, but does not include the year 1888. A fourth style shows a white title stripe with a low number (1-100), pasted over the original title. All of these "B" series printings were probably issued during the early 1890’s. 1183.B. EXTINCT GEY. CONES, MT. SCHURS. Ingersoll’s Blue-Letter B Series had many printing styles. Of all of his Cabinet Sized Mounts, they are the most common today. This scene of Monument Geyser Basin near Gibbon Meadows is noteworthy. There is no series credit on the bottom of the view. 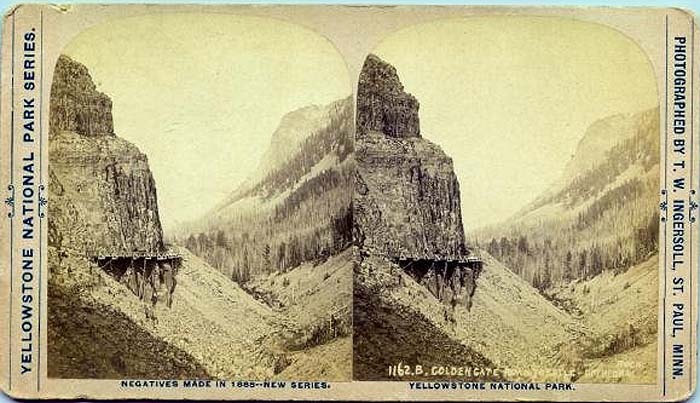 Most other views from this series contain either the line "Negatives made in 1888 – New Series" or the line "Yellowstone National Park," or both. This view of Golden Gate has both bottom credit lines. It is one of the more common styles of the Blue-Letter B Series. 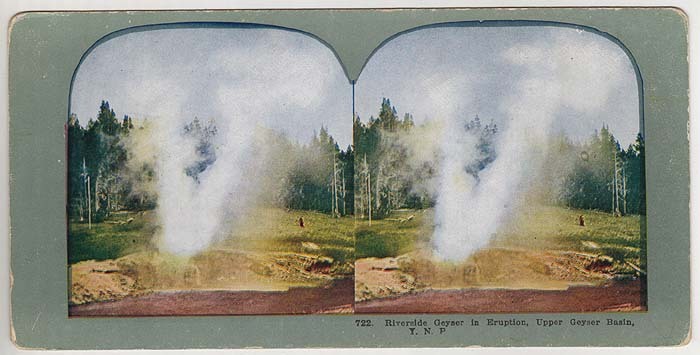 This view of an erupting Splendid Geyser is nearly the same as the view above, with the exception of the side credit lettering style. Another printing contains only one credit line on the bottom. 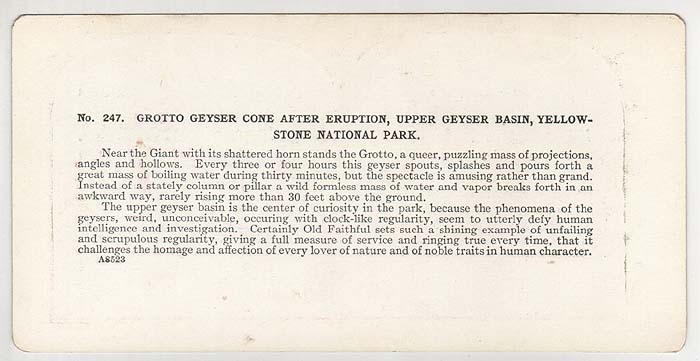 This view of Lone Star Geyser was probably an older negative that Ingersoll re-used and thus did not need the "New Series 1888" credit line. Yet another printing with different side credit lettering. This scene shows a coach traveling through the large boulders at Obsidian Cliff between Mammoth and Norris. 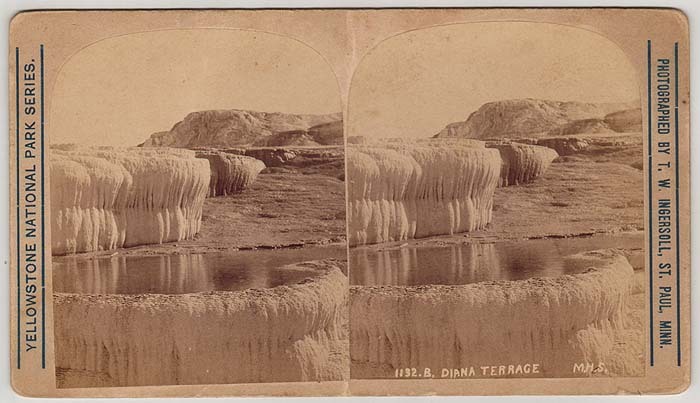 This view of Diana Terrace is identical in style to the view above of Golden Gate Trestle. The difference is that the side credits are reversed. Is this a different printing? I do not know. 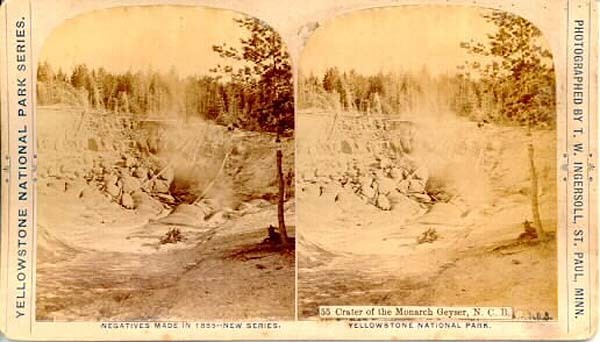 55 Crater of the Monarch Geyser, N.G.B. Probably the oddest printing of the Blue-Letter B Series are the views with low number titles pasted over the original title. This must have been a much later issue, or it was released by some independent agent who printed his own titles. The photo shows the crater of Monarch Geyser at Norris Geyser Basin. Most, if not all, Blue-Letter B Series stereoviews have this verso. Unfortunately this was the last of Ingersoll’s elaborate reverse advertising. 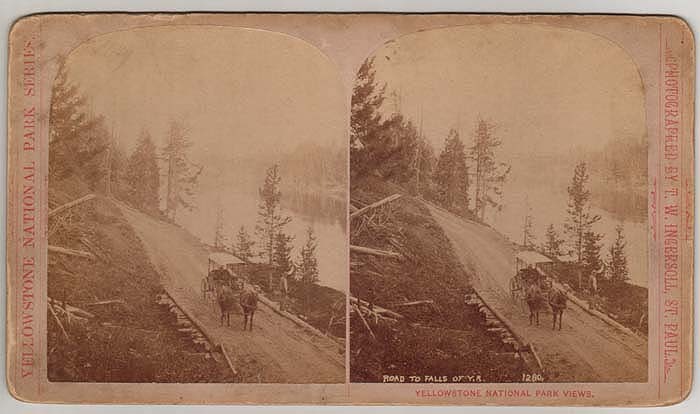 YELLOWSTONE NATIONAL PARK VIEWS ON LINE OF NORTHERN PACIFIC R.R. 1114.B. M.H.S. HOTEL, 446 FT. LONG. 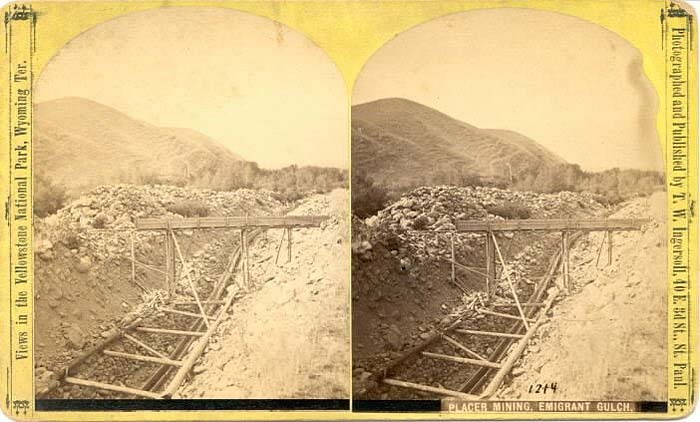 Ingersoll’s Northern Pacific Railroad stereoviews only have one style. 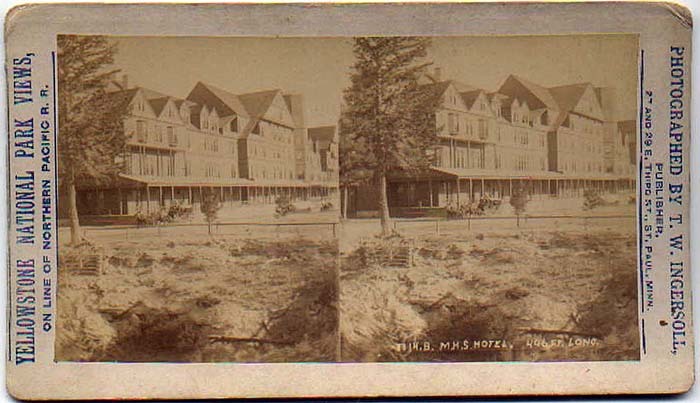 This image shows the National Hotel at Mammoth. 1265.B. GRAND FALLS INSTANTANEOUS, 360 FT. HIGH. Another of Ingersoll’s Northern Pacific Railroad views, this photo is included because the exact same photograph shows up under the publisher, New Educational Series. This further indicates a direct relationship between the two publishers. 1277.B. Y. RIV. CANON FROM LOWER FALLS. The "Selected Views" set was a small issue of Blue-Letter B Series views. 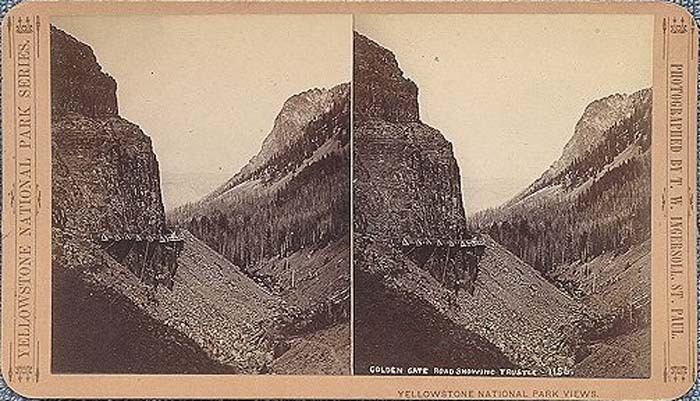 This image shows the Grand Canyon of the Yellowstone. This plain yellow mount has no credit of any kind. The titling makes it an obvious Ingersoll Blue-Letter B Series view. It is not known if this is a pirate view or if Ingersoll released these with no credit. 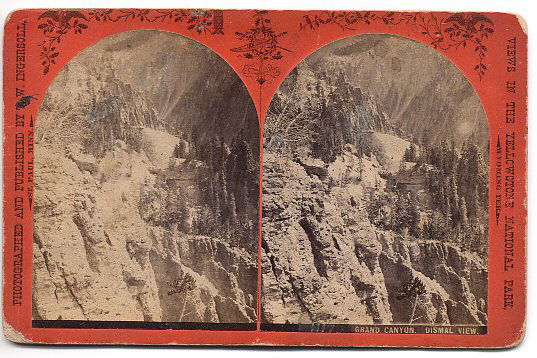 This is the series for which an Ingersoll stereoview catalog does survive. 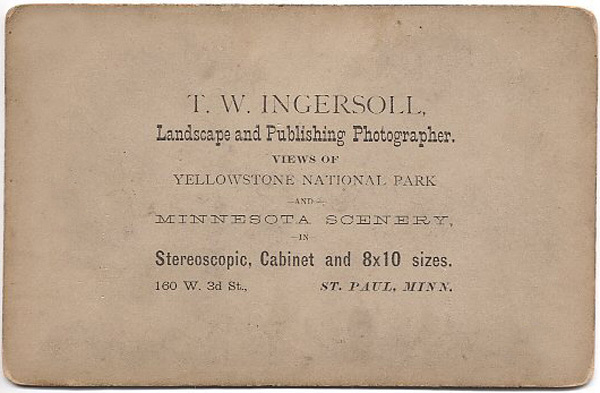 It was the first set of Ingersoll Yellowstone views that were produced on regular sized mounts 3 ½ x 7. They are of generally mediocre quality and have not held up well. The photos are often faded and titles are hard to read. They all have the title on a white strip over the photo on the lower right front of the view. Numbering is from 1100-1289 and is NOT sequential! There are 38 numbers missing. They were probably damaged or duplicate negatives. This is significant. All photos from this set were taken directly from Ingersoll's red-letter "A" series and blue-letter "B" series. Also at least one view from this set is actually a photograph by F. Jay Haynes. Whether or not this photo was purchased or pirated is not known. Views from this series were also available in a poorly tinted form. Probably by special order only. Not all views exist in this tinted style. Ingersoll’s New Series. These were issued in 1899. They are of poor quality and often fade. They were re-issues of earlier Ingersoll negatives on cheaper curved mount stock. This photo shows Kepler Cascades near Old Faithful. 1192 Gibbon Falls from below. Another of Ingersoll’s New Series. Aging gives the illusion of different card stock, but these two images are of the same style. 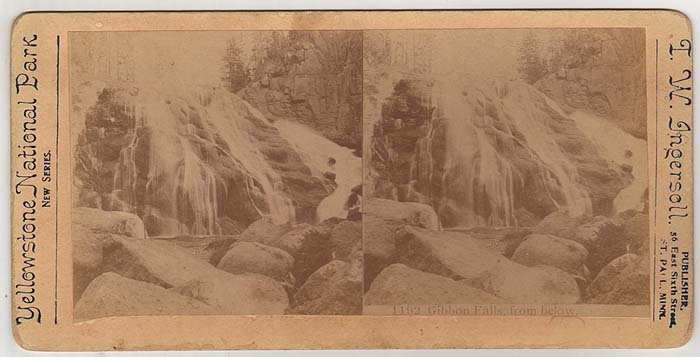 Here we see Gibbon Falls from its base. 4563. 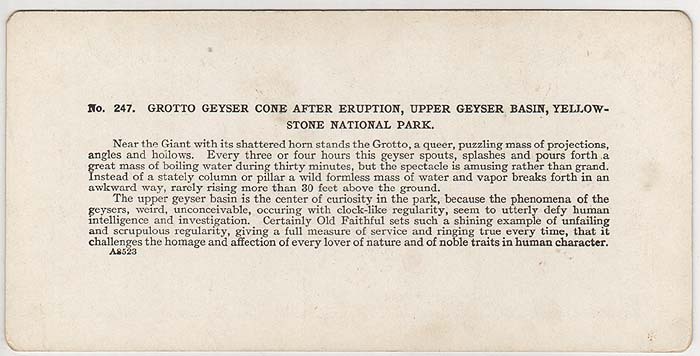 Giant Geyser in Action, Bryant Profile. An odd photo from the New Series is this one of Giant Geyser numbered 4563. It does not appear in the Ingersoll catalog. In fact it may have been taken by F. Jay Haynes. 1102. Devils Slide - Cinnabar. Ingersoll did release poor quality tinted views for the first time in this set. This one is of a rail car near the town of Cinnabar, Montana. Devil’s Slide can be seen in the distance. Two other common Ingersoll sets use photos from the 1899 "New Series." First is his "Sporting & Hunting Views" series. 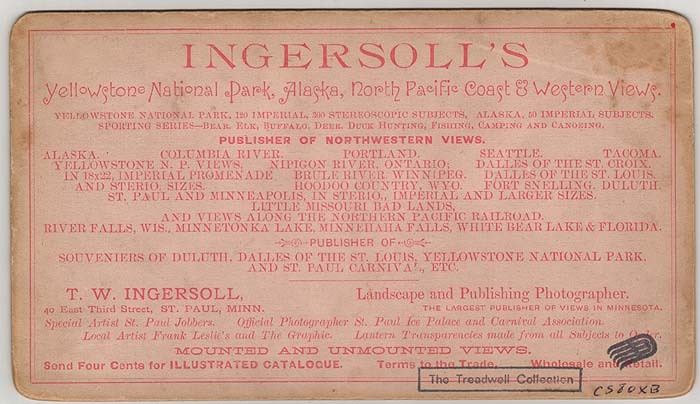 This set shows many views from Ingersoll’s home state of Minnesota. Much of it is devoted to waterfowl hunting. It does however contain a few Yellowstone scenes. 109 Camp on Yellowstone Lake. 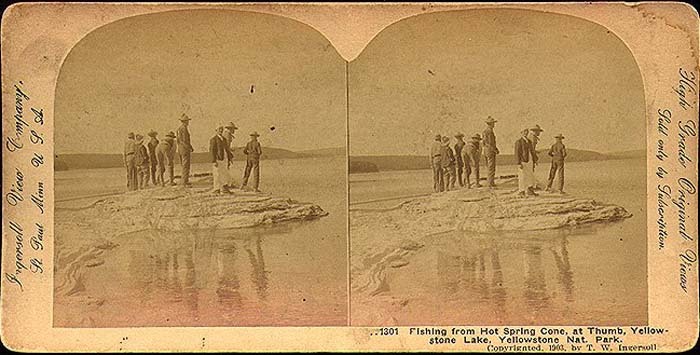 This amazing photo shows the famous Camp on Yellowstone Lake. It is almost but not exactly the same as the one taken by F. Jay Haynes. It was definitely taken at the same time. Is this a Haynes photo? Or were Haynes and Ingersoll at this camp together? 3117. Our Camp near Lake Abundance. 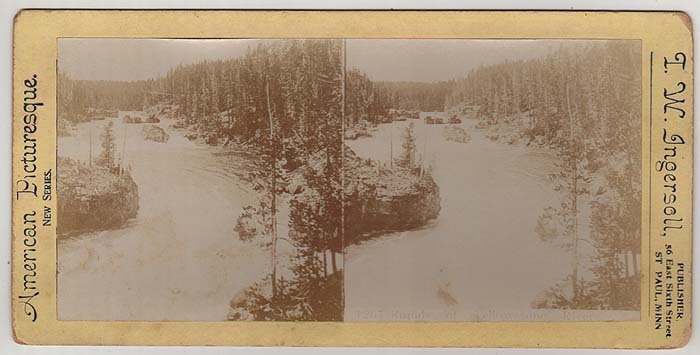 This view shows the same group of men camping at Lake Abundance near present day Cooke City, Montana. Second is the "American Picturesque." set. This group contains views from around the United States including several of Yellowstone. 1267. Rapids of Yellowstone River. The American Picturesque set contains views from around the United States. This image shows the Yellowstone River above Upper Falls. These views are most interesting. 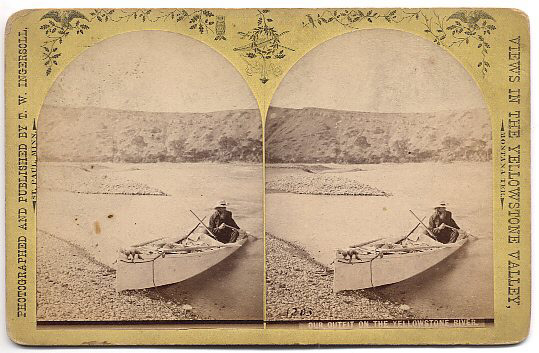 They represent a renaissance in Ingersoll stereoview production. 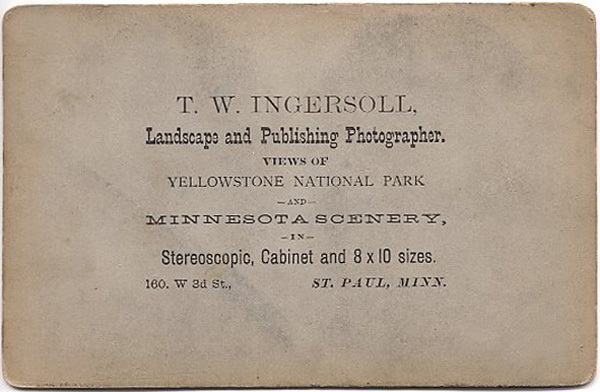 At a time when he was only issuing cheap color lithographs, Ingersoll once more returned to Yellowstone and produced a high quality black and white series on thick card stock. The series was so successful that it was re-issued several times in various forms. The views are copyrighted from various years in the 1900’s. They are all pre-1910. 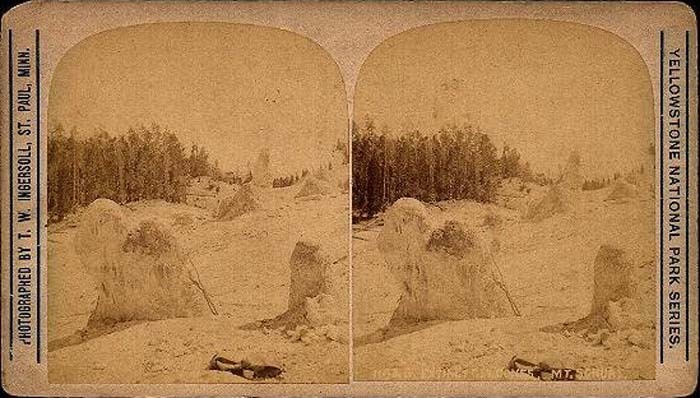 There are three styles of stereoview as a result of this last Ingersoll trip to Yellowstone They all have similar photographs but are different in the exact wording of their photo titles. This was most likely a door to door set only. All view titles have two dots preceding the title. There appears to be only one printing of this style, as no variations have appeared. However there is a subset (or boxed set) that was available for purchase, as indicated by the numbers in parenthesis on some views. These numbers go as high as 72. I suspect a 75 or 100 view boxed set does exist in some form. One of Ingersoll’s later sets of high quality. "High Grade Original Views" appears on both sides of the view. Most titles from this style start with two dots, but some begin with four or six. Numbers range from #1100 – #1301. There is a slight color variation on some of these mounts (an indication of multiple printings). ....1214. 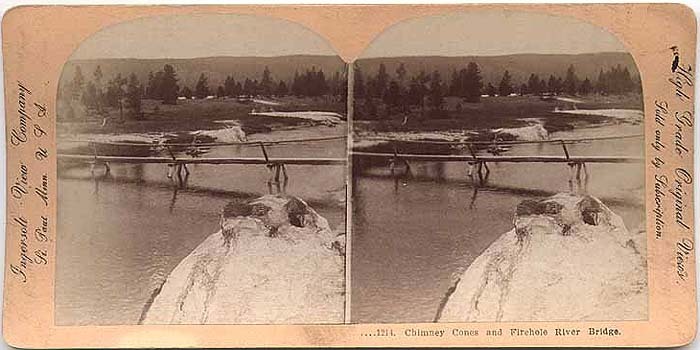 Chimney Cones and Firehole River Bridge. An Ingersoll View Company tan mount. This view begins with four periods as opposed to others with one, two or six. This image shows an obsolete bridge over the Firehole River at Upper Geyser Basin. Yellowstone Lake, Yellowstone Nat. Park. Copyrighted 1903 by T. W. Ingersoll. A higher number Ingersoll View Co. tan mount. This view only has two periods. It shows a group of tourists at Fishing Cone in the West Thumb Geyser Basin. Gray Mounts – sometimes company titles are reversed. These are the gray mounts with silver writing on the view sides. With few exceptions, all titles start with two dots. Several have no dots. Numbers range from #1100 – #1364. This set appears directly related to the previous set above, but since it contains more total views, I am not sure which one was issued first. The titles of the two sets do not match. There is a subset (or boxed set) to this silver set, as indicated by the numbers in parenthesis on some views. I have seen numbers as high as 56 in this subset. This silver set was also available in high-quality colorized versions. They were likely by special order only. A good example of the Ingersoll View Company gray mount with silver lettering can be seen here. This was Ingersoll’s last original series of Yellowstone. 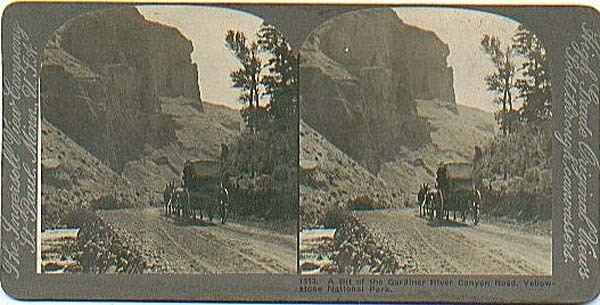 This view of a coach in Gardner River Canyon has no copyright date but is from around 1905. Copyrighted 1906, by T. W. Ingersoll. A second type of view is this one of the Old Faithful Inn. It does have a copyright date of 1906 on the lower right side. ..1216. Sponge Boiling Spring, Upper Gey. Basin. Y.N.P. Some views in the gray mount set were color tinted. They were far superior in color to those from the New Series. 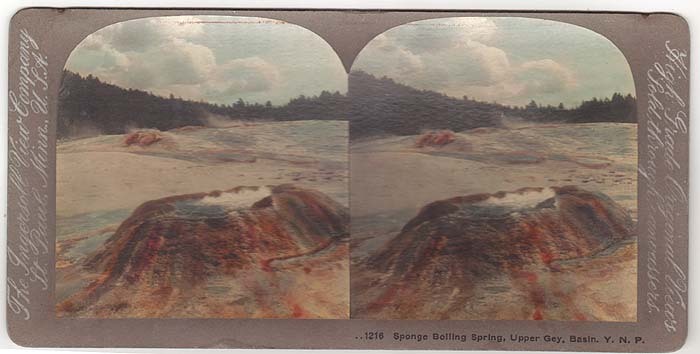 This image is of Sponge Geyser on Geyser Hill in the Upper Geyser Basin. Yet another Ingersoll set about which little is known. ......1154 Pulpit Terraces - Southward. This view of the Pulpit Terrace is on lighter card stock then its counterpart below. Both types were sold by canvassers only. Another of the American & Foreign Views. This one of Tower Fall is on darker card stock. ......1264. Grand Falls & Yellowstone River from Point Lookout. 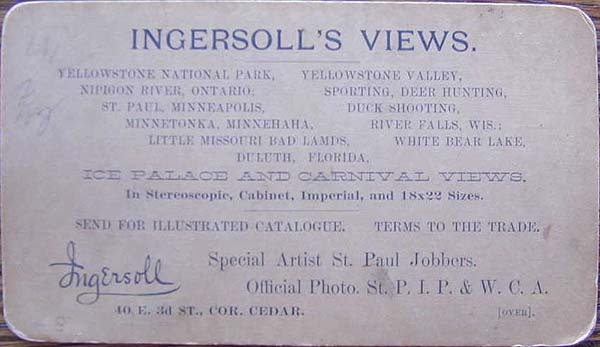 Like the Ingersoll View Co., these were available in color tinted form. They were probably by special order only. This one credits L. Swingle & Co. of Hicksville, Ohio for the color tinting. 1163 Golden Gate and Pillar. Here wee see a view that on the right side now credits Liberty Brand rather than T.W. Ingersoll. Clearly this is still an Ingersoll view. This probably represents the transition over to the New Educational Series, which were primarily made up of Ingersoll views as well. Copyrighted, 1903, by T. W. Ingersoll. A low number Ingersoll lithograph. This one was part of a set of United States views. The publisher of the set in uncredited. 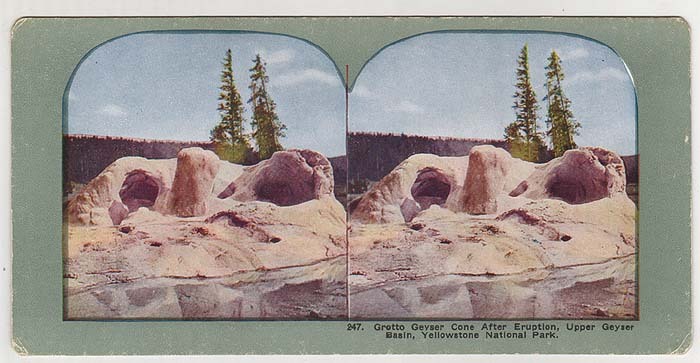 This common Ingersoll lithograph of Grotto Geyser was issued as part of an 800 view set of world views. It was re-released in many forms and subsets as well. Two printing types of this view are shown. A second printing of the above view. 485. Millions of Trout in Yellowstone River. 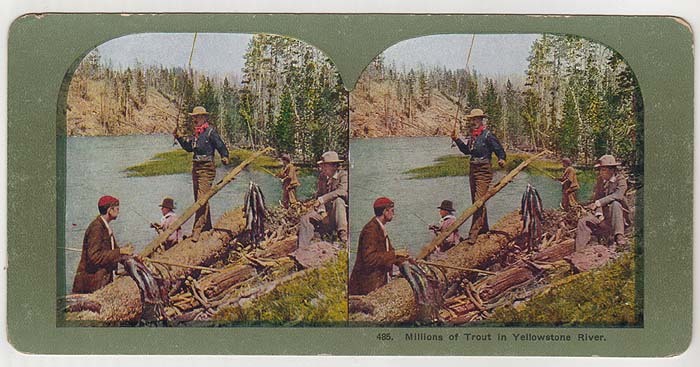 Also part of the 800 world view set, this fishing scene was part of several angling scenes from around the United States. 722. 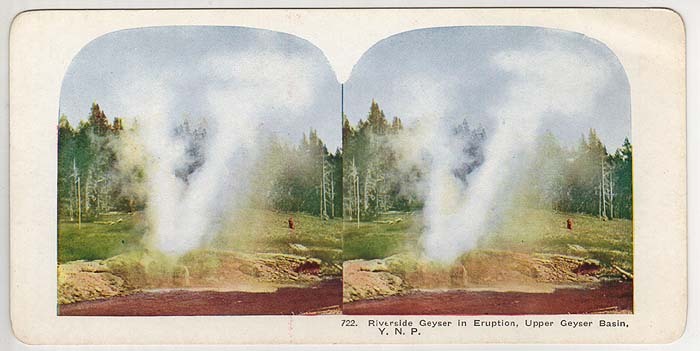 Riverside Geyser in Eruption, Upper Geyser Basin, Y.N.P. The 700 numbers from the 800 view world set comprised mostly parks and nature scenes. 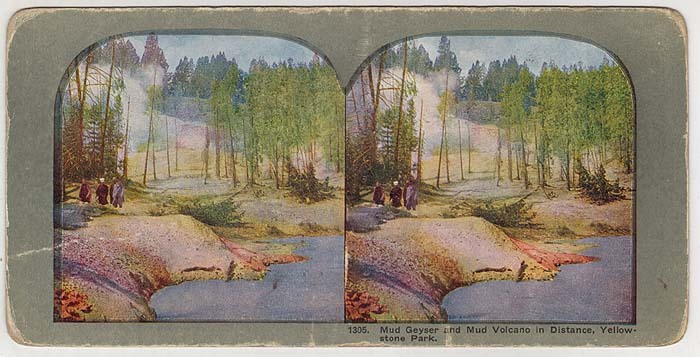 This scene shows Riverside Geyser in eruption. One of the re-issues of this view was with a white mount background. These white mounts were not issued for all 800 views, but only a select few. This view is part of a set issued in 1905 by Sears, Roebuck & Co. as their "Oleograph" set of educational views of U.S. & World subjects, with glossy finish cards. Originally it was sold as a boxed set of 200 views. 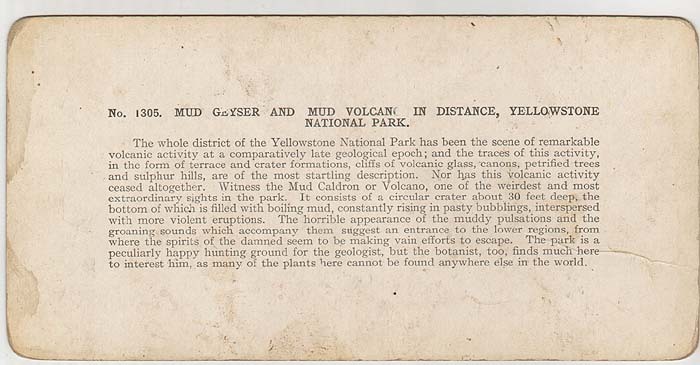 Cards are numbered from 1200 – 1399 and contain many Yellowstone views. For more Ingersoll images, see also: New Educational Series, Whiting View Company, W. R. Cross.